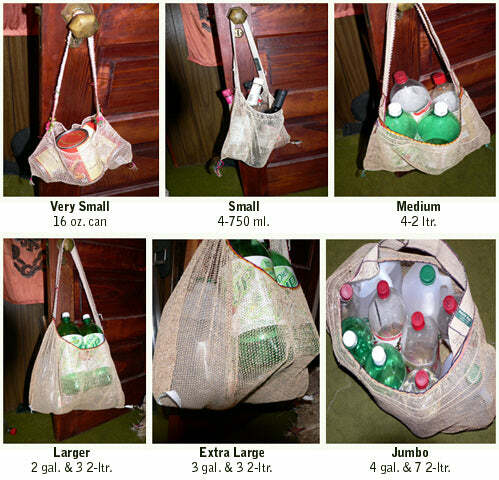 Because of the varying structural characteristics of the bags, physical dimensions do not sufficiently indicate the carrying capacity of the bag sizes. Each bag stretches, but to varying extents and in different ways. The best means of choosing a bag according to your carrying needs is to look at the photos demonstrating capabilities you can expect from each size. As a base line, the medium bag will hold 4 2-litre containers of beverages (as they are commonly sold in North America). On a practical basis, a medium or large size bag is best for most people who use their bags to carry lots of different things. The bags will hold a number of large objects, and there almost always is room for additional medium or smaller size objects. “Filling” a medium, large, extra large or jumbo sized bag with heavy objects usually will result in an overall weight that is greater than the average person wants to carry. The ratios of height to width can vary substantially. The Khmu prefer the bags they use to be wider rather than taller. This profile causes bags carried on shoulders or around the neck to tend to curve around the torso of the carrier rather than protruding forward or backward when loaded. It also lessens the need to stack cargo items on top of each other. We like the rationality of this shape, but to conform to style expectations created by the conventional taller and narrower shapes of paper and plastic bags commonly used in most of the world, the Khmu also produce bags with greater height/width ratios.